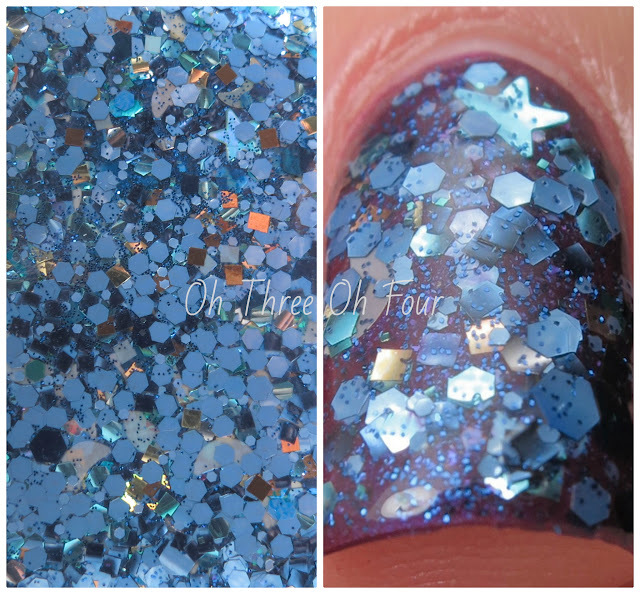 *Waves* is a mixture of matte and metallic blue glitter in various shapes and sizes, accented with gold and copper glitter all in a clear base with ultra fine blue glitter. I layered 2 coats of *Waves* over 2 coats of Tip Top Nails Funfair Madness. Something Blue has assorted whites accented with pastel and iridescent blue glitters in an aqua and blue shimmered base. All nails are 2 coats of New York Color Hot Green with 1 coat of Something Blue and top coat. Something Borrowed contains assorted whites accented with pastel lilac pink and ballet pink glitters in a white and pink shimmer base. 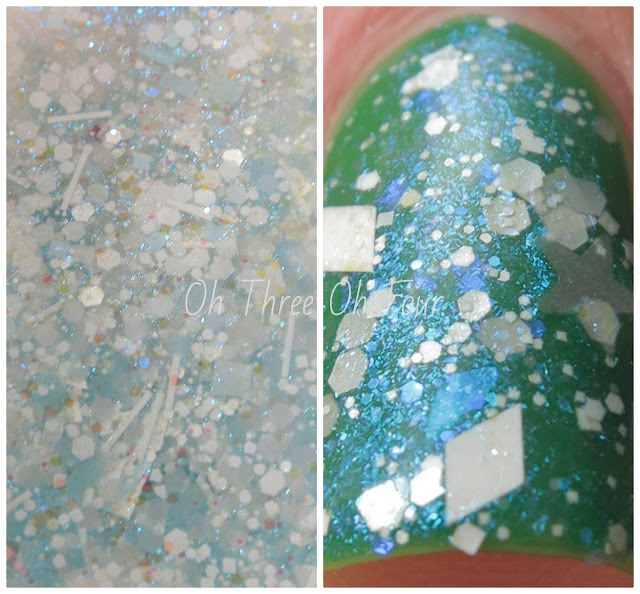 I layered 2 coats of Something Borrowed over 2 coats of Pure Ice Fairy Godmother with top coat for these photos. I thought I would go with a nice soft, girly color for this polishes base polish, to be in line with the wedding theme for at least one of the polishes in this set. ;) Once again the shimmer and white glitters are just simply amazing! Violet Was the Wild One is described as a complicated mixture of violet, purple, green, black and white glitters with iridescent blue sparks and scattered multiglitter. All in a clear multi-shimmer base with holographic microglitter. I layered 2 coats over 2 coats of L'Oreal Mango Mama with top coat. Purchase Lynnderella lacquers through Lynnderella.com. If you are international, make sure to check out Norway Nails selection of Lynnderella lacquers. Make sure to check out the giveaway running on the Lynnderella Facebook fan page. You can get one entry for just being a fan and if you own Elf Assured, post your manicure picture to any of the Lynnderella fan pages and gain 5 more entries! Find all the Lynnderella fan pages on Facebook, Twitter, Instagram, Pinterest and Tumblr!